This is just a trailer, one that’s available for public consumption, but I think I still need to put up a warning. I know there are people who want to walk into a movie theater with zero knowledge about the film they’re about to see – if you’re one such person, you should leave now because there will be spoilers here. I might also touch on some details from previous Marvel Cinematic Universe films. It’s been months since the last MCU film was released and I’d expect everyone interested in this universe to have seen all the films by now, but if you’re someone who hasn’t and still has plans of watching any of the MCU films, I won’t hold it against you. Please, do not read on if you do not want to be spoiled. We really need Black Widow in her own movie. This isn’t the Civil War that people were anticipating. I already said that is going to be different from the Civil War limited series/event in the comic books and this trailer validates what I said. The comics event known as Civil War revolved around the Super Hero Registration Act (SHRA) and the conflicts between the heroes that were for and against it. Basically, registered superheroes went after those who did not register but still continued their superheroics. The film version of Civil War is about the conflict surrounding the Winter Soldier – those who want to take the Winter Soldier down and those allied with Captain America. That doesn’t mean that the registration act won’t be in the film – those involved with the production of the film have already said that this will be in the movie. But I don’t think that registration will be that significant to the plot. My theory is that the registration act will only serve to piss Steve Rogers off and cause him to step down from his Avengers leadership role, forcing Tony Stark out of retirement. It may also further justify why armed forces are chasing after the Winter Soldier – although his past crimes should already be enough for that. Sokovia is the country where Strucker’s HYDRA base was and where Ultron commenced his grand scheme in Avengers: Age of Ultron. There won’t be a Stamford Incident in the movie. The SHRA was passed as a response to the Stamford Incident wherein the supervillain known as Nitro caused an explosion that killed a significant number of civilians and changed the public’s view of superheroes, setting the chain of events that culminated in the Civil War event. The Captain America: Civil War trailer has a reference to Sokovia where Baron Strucker’s HYDRA base was and where Ultron hatched his grand scheme in Avengers: Age of Ultron, and it looks like the events of that film will be used in place of the Stamford Incident as a reason to start this whole registration initiative. This is significant to me because if this were the case, then Captain America: Civil War won’t spend a lot of time on set up. It also means that we won’t be seeing the New Warriors or a similar team of superheroes that will cause an incident similar to what happened in the comic book series. This may also mean that audiences will need to watch Avengers: Age of Ultron in order to have a better understanding of what will transpire in Captain America: Civil War. This is a Captain America movie, not Avengers 2.5. While the Avengers are front and center of Captain America: Civil War, this is Captain America’s story. The main players, at least in the trailer, are all viewed based on what their relationship is to Steve Rogers. And this is a good approach in developing the character of Steve Rogers further. You’ve got Black Widow and Iron Man, friends and comrades of Captain America who now have opposing views on how to deal with the Winter Soldier. Both have different motivations and thus react differently to the conflict; note the reluctance in Black Widow and the disappointment in Iron Man. You’ve got Bucky who clearly appreciates the thought that his longtime friend is at his side through thick and thin, and the Falcon who is more of a loyal soldier who really believes in Steve Rogers’ ideals. Awesome characterization right there, and this is just the trailer. Team Rogers in action (from left to right): Falcon, Hawkeye, Captain America, Ant-Man, Scarlet Witch, Winter Soldier. Just kidding, Ant-Man isn’t in this picture. Where’s Vision and Sharon Carter? Both characters were prominently featured in the concept art released some time ago, but don’t even make an appearance here. Is this a sign that their roles are relatively minor compared to the rest? On a related note, why was Scarlet Witch left out of the concept art but was shown in the trailer as part of Cap’s team? Is she going to be taken out early on in the film so she’s not in the final lineup? On a related note, Spider-Man/Peter Parker doesn’t make an appearance in the trailer and I don’t think he should. His appearance has been reported to be just a cameo, and there’s really no real purpose for Spider-Man to be in a film that revolves around the Winter Soldier. I think audiences should lower their expectations of Spider-Man’s appearance and not hope for anything more than a simple cameo. What are the heroes’ motivations? Now that we have more clarity on what the plot of Captain America: Civil War will be, I’m very curious about what the motivations of the characters are. Black Widow appears to remain as a government operative and she barely survived at least two encounters with a mind-controlled Winter Soldier before, which explains why she’s going after him. I’ve seen sources claiming that the Winter Soldier was behind the assasination of Howard Stark, Tony’s father, so I can understand why Tony is leading the charge. And James Rhodes (AKA War Machine) of course is loyal to Tony and to the U.S. government. On the other side, Steve Rogers is of course going to stay at his longtime friend’s side, especially since he knows that Bucky did not commit those crimes willingly. Sam Wilson (Falcon) is showing that he believes in Rogers’ ideals and will be loyal to him. But why is Black Panther chasing after the Winter Soldier? Why is Hawkeye and Scarlet Witch helping Captain America? What motivation does a sentient android like the Vision have in this kind of conflict? It looks like there’s plenty of character development for each of the Avengers in this film. 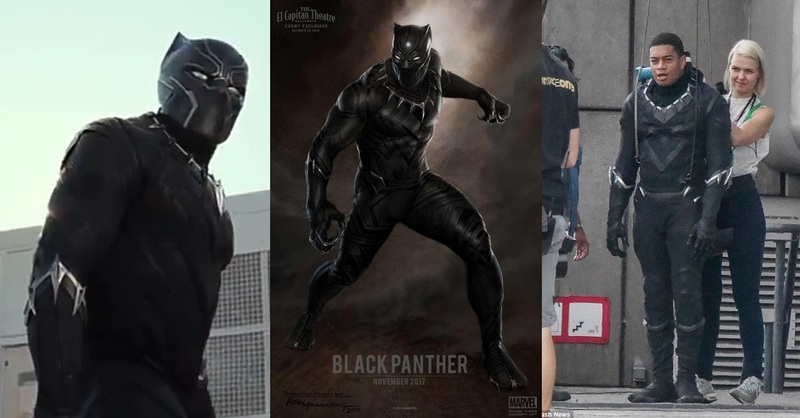 From left to right: Black Panther as shown in the trailer, concept art, and one of the set photos released early this year. Speaking of Black Panther, he looks awesome, doesn’t he? There were plenty of people who voiced out reservations when the set photos of the Black Panther costume was released/leaked out to the public early this year. Now that I’ve seen how the costume looks like after post-production, I think it looks good. The costume design fits in the Marvel Cinematic Universe, and even in that quick action sequence it looks functional. I hope his inclusion in this film will get audiences interested in the Black Panther film. Can Stark hold his own against two opponents who are highly-skilled in hand-to-hand combat? Probably not. Iron Man is just a supporting character. Have we ever seen a film where a character strong enough to be the lead in his/her own film take on a secondary role in another? We probably have, but not in a superhero film. Batman and Superman are co-leads in their crossover film, but it’s clear in this trailer that this is Captain America’s story. It may not be significant to most but I’m already thinking of the possibilities of this concept. Can you imagine other lead characters doing the same thing and make appearances in other films? It’s already been announced that Hulk will be part of Thor: Ragnarok, and we may see other lead heroes like Iron Man and maybe even Spider-Man have significant roles in Marvel’s other films like Captain Marvel and Guardians of the Galaxy. I think this approach can help drive interest in films with lesser known leads like Ant-Man and Black Panther. And these are the ideas and thoughts that came to me after watching the Captain America: Civil War trailer. I think this film has a lot of entertainment value to offer to moviegoers and will be a great way to open Phase 3 of the Marvel Cinematic Universe film slate. I can’t wait for this film to come out. Have you seen the Captain America: Civil War trailer? What did you think about it? Let us know in the comments section below!